Only Adults can complete the woodworking hobby, to begin this hobby you need to buy the woodworking bench from the promotions r us store and place it in one of your sims houses or you can use the benches at the community center once you have completed the Multi Story Renovations Quest. I cannot place the woodworking bench, it says its locked/ limited item, what do I do? You will have this problem if you try and place it from the new items tab, look in your inventory instead to be able to place the woodworking bench in one of your sims houses. Every time you complete one of the options above your woodworking hobby skill level up percentage will increase, once you reach 100% you will level up, there are 6 levels. You need to reach level 6 to be able to unlock all of the woodworking collectibles, once unlocked you will be able to find them. For example if you did the 12 hour 30 minute option, you would need to do this 5 times or the 5 hour option 17 times to reach level 3 from level 2. Master Craftsmen Wooden Dragon and Ragtime Runaway are now unlocked in the hobby collection. 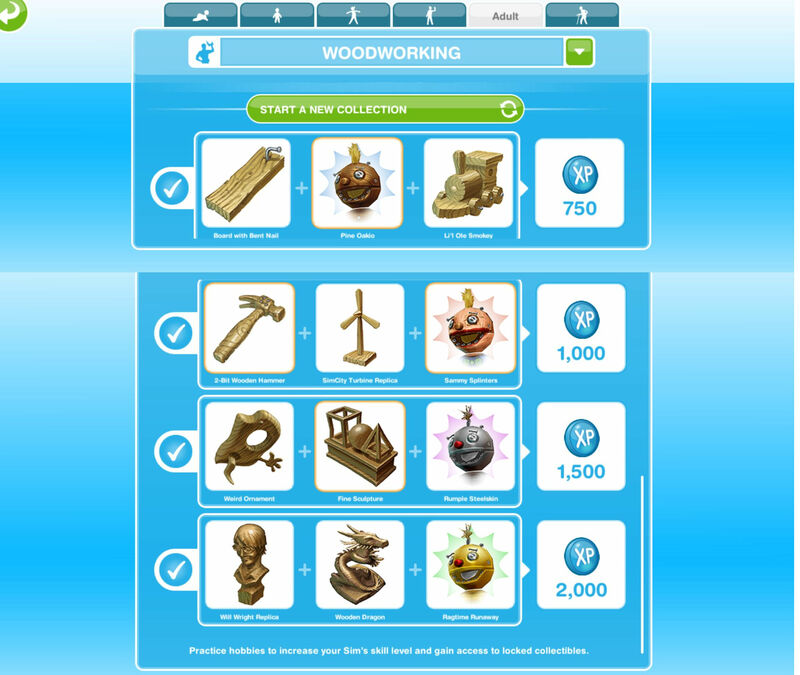 Time Limited Hobby Events– the woodworking hobby appears often in these events, to complete these you have to complete the woodworking hobby a certain amount of times during the time limit to unlock all of the prizes, you can find a list of time limited hobby events here. If you want to complete these time limited hobby events then have one sim get to level six in this hobby before the next event starts so you only have to do the shortest option when the event begins! For my first woodworking attempt, before completing the multi storey task, I just produced a monkey that ran away! Ps. Your blogs are fantastic! How do you get the pine oakio and similar things if you buy a bench and have it at your house but there are no pipes for them to run around? Thank you so much for this! I was stuck on a task in the multi story Renovations quest, and I didn’t know if I could get anything from the wooden doll, but now I do! I had no idea you wanted to get it to jump out the window with your sim, 😂😂😂! This woodworking hobby drove me nuts! It took two days to get the first set of pieces, and by that time I’d filled in all of the sets – the board with nail was the last piece and it took forever. I finally put two sims at work in 10 minute increments and used up a block of LPs to repeatedly cancel the actions by the third Sim after starting the one- hour time block, and that was when I finally got it. I don’t know if that was a useful strategy or just plain luck, but it worked. Fortunately I’d saved up a bunch of LPs and used most of them to quickly finish the Multilevel quest, and I got the elevators! Since I normally don’t have so much free time, this may be the only big “prize” I earn. Now I have almost no LPs left and will just work slowly through the following quests. I think EA miscalculated on this woodworking process, I was about to throw my iPad across the room when I finally got it done. In the end it wasn’t fun any more. Thanks for your wonderful blog. You have a bright future in store, I’m sure, with the type of talent it takes to compile such a well-organized, comprehensive and accessible database! That’s very unlucky I feel like they have recently made this one even harder to complete in the time limit- its already tight as it is! I hope you find future quests more enjoyable! I agree! I have been on the same one for 10 days with 21 sims working and yet to complete the first set. Sent multiple complaints to firemonkey’s zero reply. The event ends in 3 hours and I didn’t collect 1 item. I wonder how much does the woodworking bench cost when I unlock it? Because I want to finish this hobby as quick as possible. Sometimes when I complete ‘Quick Practise’ I get this wood doll that ballistically runs up and down the pipes of the community center. I click on the bubble with the ‘!’, Over and over again! But he keeps running in different directions. Is there something I need to do before he jumps out the windows? That really is the only way to catch him, you just need to click as quickly as possible to get him to go to the right window unfortunately! Where can I get a foosball table? All of a sudden I only have a 5 hour short option instead of 10 minutes 😦 Did that happen to you? yes, this was an update, I have updated the post with this. My social task at the moment is to carve a weird ornament at a neighbours community centre, but I only have the option for 5 hour quick practice or 12.5 hours carve magnum opus so can’t complete the task because of the update. Yet the task has only just appeared since I completed the previous so since the update, it doesn’t make sense? I don’t want to spend 10LP to skip it 😦 any thoughts? Sorry if something has already been posted about this. Hi =] I’ve completed the full collection and it says I’ve unlocked the Dog Kennel to be found at the home store (it has the pink tick and all) but I’ve scanned my whole entire home store and I don’t see it anywhere to be bought. Same happened with the sim outfits unlocked by completing the fashion design hobby, sims are supposed to be able to wear them, right? But again I can’t find those anywhere. Is this because I completed those collections during the ringlets of fire and urban furniture events? I am on my third time through the woodworking hobby, and after completing the second time it said I had unlocked the foosball table, however I am unable to find it in the living room section. Have you looked in the inventory section? Can I do this hobby without building the community center? Where can I find the foosball table prize? At the community center my sim made a wooden doll that jumped out of the window, why? Why haven’t I found a certain piece yet? Some take longer to get than others so just keep going, you will find them eventually! Do all hobbies and careers have special outfits specific to them? Thank you. Though there is at least the chef’s outfit for cooks. Only if you completed sous judgemental in the time limit. Hello! I was hoping you could help me, I have just unlocked the foosball table and reset the collection, but I look at EVERY tab in the Home Store. It isn’t in the Living Room selection. Do I need a certain building to unlock this? I wanted a cool new decoration for my house with a sporty kind of family. (And also for I have a house with 3 kids with the Roberts last name? Is this a glitch? There are 2 teens and 1 infant. May have been with latest update?) and I LOVE the blog I would be stuck in Seniors quest without knowing for the Snow Park! Thanks in Advance!! Thanks, I’m glad that helped! This is seriously the worst hobby. By the time you reach level five, going 5 hours at a time only increases the hobby 1%! One percent increase for five hours of woodworking is ridiculous. It’d make more sense if the prizes were interesting, but for a doghouse? Pass. Seriously the last level is only 4% for 12.5 hours. I’m going to need two weeks to reach level six. I’m guessing the urban furniture event will be a lot sooner than that. Last time this event was available each time you did the 5 hour option you were able to level up so hopefully it will be the same this time, I don’t know why it takes so long to level up outside of the event though! Hello, I haven’t gained the whole collectibles for this hobby since I stopped doing it a while ago when I reached level 5, however the woodworking bench is available in hobby stores for me to buy. Anyway, the urban furniture event is coming soon for me and I am concerned that this will hinder my sims to get the complete woodworking pieces, as the 10 minutes and 1 hour options are no longer available, and it is soooo… unbelievably difficult to increase skill progress now. Kay L, you are so right! There’s something off with the metrics, before I reset my game I was able to max out this hobby at roughly the same rate as other hobbies. But now I got 1% per hour (12% for magnum opus) at lvl 3/6 and about half that at lvl 4/6. That’s gotta be close to a month straight grinding to be maxed, not even talking about getting all the collectibles. Ridiculous. Also, someone had posted a question in another section asking if you hit 100% on a hobby level while still working if it keeps going- i.e. If you’re at 98% and start a 12 hour practice, will it top out at 100% or carry that over moving you forward on the next level. The woodworking hobby does NOT carry over, and I have seen that on a couple other hobbies too. Not sure if they’re all like that. So I just completed the woodworking hobby for the first time not having it as part of an event and it said I was able to purchase the foosball table. However, I looked in the store and could not find it anywhere. What do I do? It may be in your inventory under living room. Thank you so much! Also, is it possible to buy more? I couldn’t find it in the store. You’re welcome! Yes it is possible but they do not unlock in the store until a high level in the game so they may not be available for you to buy yet. My woodworking doll got away. Do I need to make another one? You will need to do the hobby again, then click on the doll to go to the window your sim is standing at. Hey i just reached level 11 and i got this new “Urban Furniture Event” in my task bar and it says coming soon. It also ays “Build the Promotions R Us store to prepare for the Urban Furniture Hobby Event”. Plz tell me should i make it or not? And plz tell me that if i send one of my sims at neighbours town and put him on work at neighbours community centre for woodworking. Will it help in any way in future, when the event opens? This event will probably be back again if you don’t build the promotions r us store for it this time but once the time is up you will have to wait for them to bring it back to the game again before you will be able to complete it again. Have a look at that post though so you can see if the prizes are worth it. And sending a sim to your neighbours will help as it will start to level them up before the event begins. How do you “create a weird ornament in a neighbor’s community center”? I’ve been trying to figure it out on my own but it doesn’t seem to work. Help!! You need to keep doing the woodworking hobby using a bench in a neighbours town until you make the weird ornament. There’s supposed to be a woodworking event to collect country homestead furniture in the last update. However, I haven’t been able to start this event yet. Can you tell me if this is happending to you as well? This event has not started yet, I will create a post on it when it begins. I’m sorry to comment here because I couldn’t comment on your post about Country Homestead Event. When the event appeared, I chose “No” because my sims was still at level 4. So if I don’t choose to enter the event on the goal tab, the event will stay there until I want to enter or it will just disappear after sometime? Cause it took me like forever to level up this hobby. If you decide not to do this event then once the time is up it will disappear from your goal tab and when the event comes back it will return and ask you again if you want to do it, you don’t have to do these time limited events if you don’t want to. Hello, I’ve noticed in other post about hobbies it gives you the level of experience you get when you complete an option. Do you have this info or did I just gloss over it? Sorry I haven’t finished updating all the hobby posts yet, I’m working my way through them but each post takes half an hour to update so its a slow process! I can’t always do the 12h30 option so I alter with 5h … Does that matter? Oh, and do we need to clear the second prize before an event starts? You don’t have to but if you don’t then the collection will reset and once the event is over you will have to find them all again to win the second prize. It is quite slow nowadays yes! There used to be a 10 minute option but they annoyingly removed that! It doesn’t matter which option you choose, the level up percentage will just increase slower if you do the shorter option. Hi! 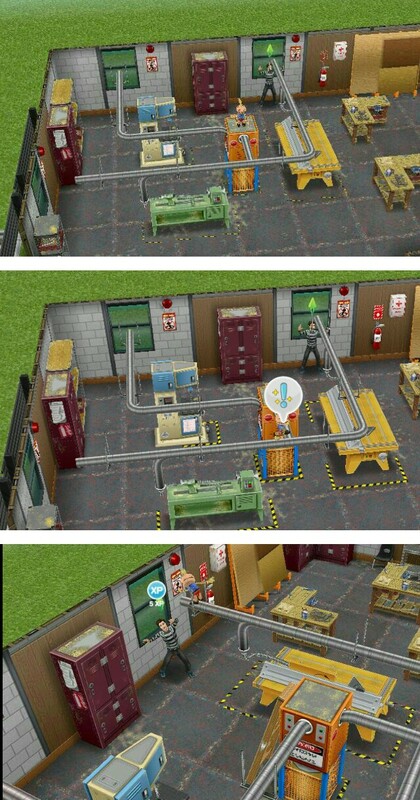 I just wanted to ask that if I don’t have a sims that is in level 6 but I have already achieved all 12 collectibles, am I still able to collect the 12 collectibles when a time limited hoppy prize event comes that needs the woodworking bench? Yes, once you complete the collection you have got a sim to level 6 so all future sims that complete the hobby will be able to find any of the items even if they are only at level 1. Hey @Magic Is there a new update on this particular one? Because I have been levelling up more than what was on the table above. For instance…I did the 12 hour option and im on level 4, instead of levelling up 12%…I levelled up 36%. And not just level 4..but level 2 and 3 as well..instead of 20% and 12%..I have been levelling up 40% and 30%..its good that it makes things faster..but just curious tho. P.S I started the hobby 6 days prior to the event .Thanks in advance. When you are doing a time limited hobby event the level % increases more than it normally does, the percentages in this post are only accurate when there isn’t a time limited hobby event currently available. I am currently having a sim complete the woodworking hobby for the first time. Omg thank you so much!!! Every time I make something in the community center it just comes up with the wooden doll and I always thought it would disappear after a couple of clicks like the fishing hobby, and then I just gave up on clicking my screen for so long and let it run out of the wrong window. YOU SAVED MY LIFE!